I did some searching and found this page, which quickly led me to the Python Developer’s Guide for the Google Spreadsheet API. That’s it. You can test that everything installed fine by running “./tests/run_data_tests.py” to verify that the tests all pass. The program “./samples/docs/docs_example.py” lets you list all of your Google Spreadsheets, for example. An extremely useful program that lets you insert rows right into a spreadsheet is “./samples/spreadsheets/spreadsheetExample.py” and someone has also got a really nice example of uploading a machine’s dynamic IP address to a spreadsheet. That’s a live image served up by Google, and when the spreadsheet gets new data, the image should update too. Why would we like to do that? Looks easy – I gave up on doing this to a MS Excel document earlier on, so good to keep this in mind for future reference..
Well reading this has certainly boosted my motivation this morning. Looks like my efficiency barrier has just been pushed up that little bit more. Chris, I have a couple follow-up blog posts that will show a neat application (to me at least). Great! But why Python script? Is it also available for PHP? Is there a php version too please? Great post! Reading your post has certainly peaked my interested in learning more about how to use python in publishing graphics on websites. As Henri said in a post, I’m interested in knowing whether Google spreadsheet supports PHP. On that time it made me curious to know that either Google is working for every programing language that works for different operating systems ? Not sure if it will continue or not. Matt, python script is not so popular. So, only a few will find this article useful. We, all want you to write some articles which have more universal appeal and reach. Hope, as a writer you will consider our request. Err, I think “all” can speak for themselves, thanks. Hmm. I like the Python script idea. You know what is amazing, is that thanks to Matt Cutts I actually know what all this stuff is now, and I dont know of any lawyer who knows as much about social media, SEO, etc., as me because of Matt’s videos and blog. I used to think Google were a bunch of closed society creeps, but their one employee, Matt Cutts, changed that. I am sold. Thanks Matt. BTW, I redesigned my ehlinelaw dot com site and based it in large part on what I learned from you. I would appreciate a comment or two from you and any of the old timers in here. oops, I had one last question. Can I use this feature on my Blackberry Bold? Matt, what’s Google’s stance on the use of Google Docs as the spreadsheet / graphing / pdf producing engine for external sites? Would it be ok to embed gdocs spreadsheet functionality within another app? how to find the number for the other worksheets? I mean, worksheet_id = ‘od6’ is for the first, but the other? Easier to use a form (which can still be POSTed to using Python, if you need to)? Matt, Thanks for this great video! It’s clear, concise and a real pleasure to watch! And the info you gave us is for me: PRICELESS! I seem to have to go to my spreadsheet, and click “publish” on the chart manually every time the spreadsheet changes. Any way to fix this? The latest (2.01) gdata version didn’t work with the latest Python. It only supports 2.4-2.6. Thank you for posting this up! I found the example extremely useful, as it is just about exactly what I want to do. In my case, I wanted to received the data in the URL and append it to a spreadsheet, so this meant all I had to do was figure out extracting the variables from the URL. Turns out the gdata module has the required functions for that, so I’m good to go. Thanks for this I found your example very useful, It’s pretty much what I wanted to do, In my case I wanted to grab some of the query string from URL and put it into a spreadsheet. 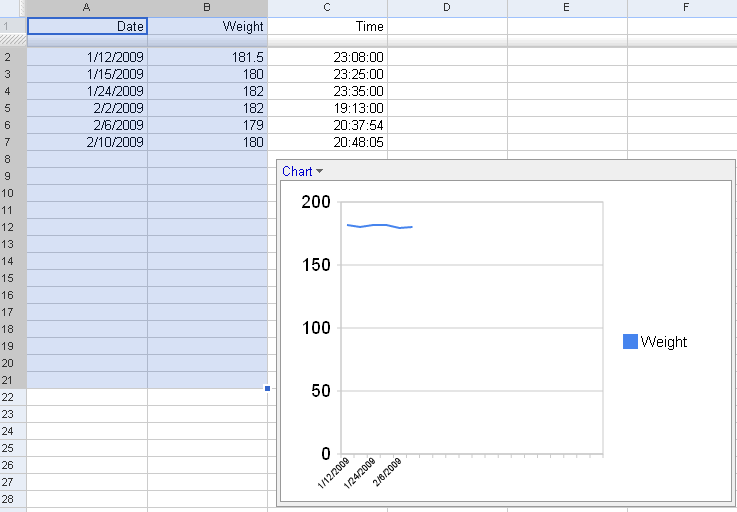 Got it all working and have leanrt alot of new features about the google spreadsheets. This broke in late 2009? Anyone know if this method still works? Thank you for the sample code and the links. I do have a question though. I need to access individual cells, and the Developer API is more like selected interfaces with some sample code. Is there anywhere that list *all* the interface functions along with their descriptions, like a man page? I just found this at work. I love me some Python and I repeated your example today using Python 2.7.1. I saw, via youtube, at IO a Python script populate and format a PowerPoint document. I’d love to to see your take on mixing up presentations, spreadsheet graphical data and Python. Maybe a follow up is due? Thanks for the information about the api!